'Caribbean Home' Large heated pool. Panoramic views of the Waterway! House, 3 Bedrooms, 2 Baths, Sleeps 6. New Pool, Deck and Boat Lifter. Welcome to Paradise! Beautiful Decorated! Confortable. Very Clean. Wireless Internet connection. Private,Large Heated pool(15 X 35). Brand New boat Deck and lifter. 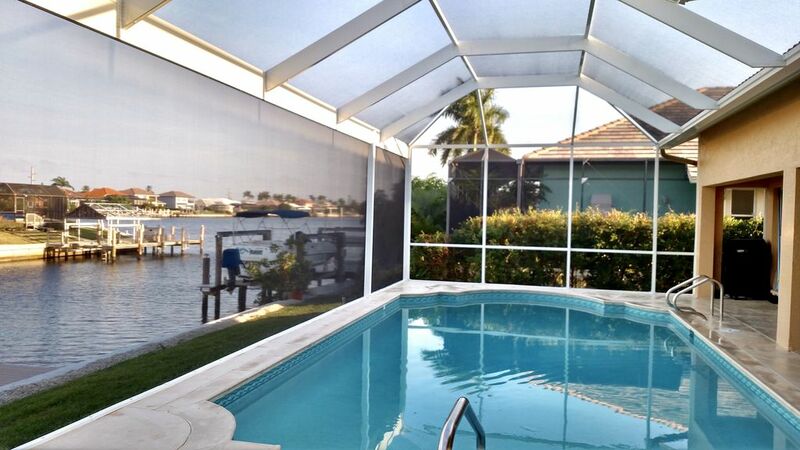 Brand New pool enclosure with Panoramic style screen. Very private and quite neighborhood. Fish from your own backyard. of one of Marco Island wider waterways. with Lanai and pool access. Gas grill and eating area, lounge chairs and portable radio. confortable bedding and new Sony TV. Quite neighborhood, beautiful waterway, walking distances to restaurants, shops, groceries, beach access. Was custome builded by us to be able to see the waterway from all rooms in the house. Confortable, many natural light all throughout the house. Nice landscape, well kept pool, lawn, interior, remodeled bathrooms, bedrooms floors (wood), all kitchen accessories, many towels, linings. Wireless internet, 3 TVs, DVDs. Privacy, all amenities of a big house, beautiful scenery, large heated pool. Beautiful Water front view from all rooms!!! Marco River with the best restaurant in the Island Snook Inn! Bistro for two KItchen Counter eating seating for 2. All the amenities: Bring only your toothbrush. Split Plan floor plan offer privacy from the Master Suite. King size bed: Master Suite (18 x 20)( Flat screen TV/Cable/DVD/phone)Ceiling Fan;Phone. Queen size bed: Guest Bedroom 1 (TV/Cable/Phone)Ceiling Fan;Phone. Twin size beds: Guest Bedroom 2 ( Phone/Ceiling Fan/Phone)Waterway. Queen Sofa Sleeper: Living Room. Vaulted Ceilings in the Family Room and Living/and Dinning room. Dinning Room area,sit 6 and open to the screened Lanai and Pool area through French Doors. Family Room: Flat scree TV/Cable/DVD/VCR. Beautiful waterway view. Kitchen: Microwave Oven;Blender( Margaritas);Ice maker; Kitchen Utensiles;Range; Refrigerator/Freezer; Electric Can Opener;CoffeeMaker;Dinnette/Kitchen Counter sit 4. Dinning Room: Sit 6 Lanai/Pool Area: 2 Lounge chairs; Table and 4 chairs to enjoy a nice dinner at the Lanai viewing the waterway. Gas grill. Pool: Raft; Children's toys available;Children's floaters. Deck: Sitting area; Sun bathing chairs; Fishing poles holders; Snook Lite; Fishing cleaning bench; Fishing gear available. Portable Radio to enjoy music at the beach or outside while you swim in the pool. Gas grill. Children Portable Playpen could be use as a crib. Air conditioner/Heater. Washer/Dryer.Dishwasher. Hair Dryer. Alicia was one of the most helpful homeowners I have ever worked with! She was an absolute delight! Our family just spent a weeks vacation over the Christmas holidays. The house was perfect! it was clean, well appointed and comfortable. The master bedroom which opened up to the pool area and the sunrise was a great way to start the day. The pool was larger then most, and heated. The grounds were kept immaculate, as well as the rest of the house. This was by far the best vacation our family has ever taken. I would recommend it to all our friends! Thank you very much for our your kind comments. families like yours, that cares and keep our property and at the same time enjoy your vacation time. We love to have you back. Publix; WinnDixie.Grocery stores 3 minutes from the house. Skiing; sailing;Water Balloon Rides; Deep Fishing trips. The Most Beautiful Sunsets in Florida West Coast! Guarantee! High Season: Dec.01 to March 30. Month $5000. All included. Week: $1800 2Weeeks: $2800 3Weeks $3800 Low Season: May 01 to Nov.30 Week: $1500 2weeks: $2500 3weeks: $2800 Month: $3000 "NO SMOKING HOUSE" $500 Refundable Deposit required to book the reservation. Will be returned one week after check-out date. Month rentals responsible for the amount over $150 of the energy bill.